When Iast blogged I was resting up in Burgos. After a few days off walking, and a truly fantastic sports massage, my knees felt a lot better. But not a hundred percent. I realised if I was going to make it to Santiago (as is traditional) then I needed to get a bit nearer the end. So I hopped on a train from Burgos to Leon (hopped is the wrong word, my legs wouldn’t have liked that). I took the train with Benjamin, who I met in Burgos, and is also suffering with knee pain. We are planning to walk (slowly) together. I felt sad leaving Burgos, especially as the friends I’d made over the first week of the Camino haf started to trickle into the city. 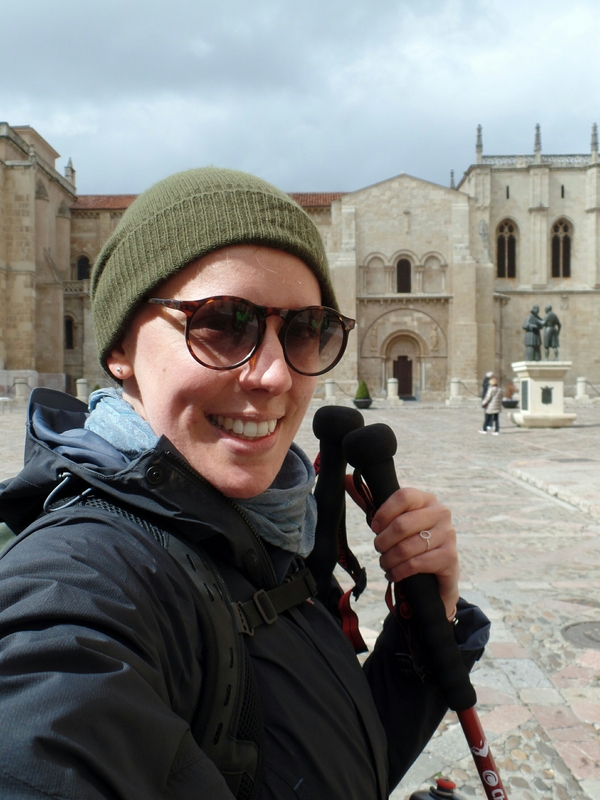 However, on arriving at León I was at once excited to be on the Camino again. So excited in fact, that we took only a cursory look around the city before deciding to take advantage of the pleasant weather and walk 8km to the next hostel. No sooner had we left the centre of Leon, than we were greeted with quite ferocious wind and hail. But once set on a course, the pilgrim wraps up and keeps walking! We did eventually arrive at our hostel, which was very pleasant (especially after my bed bug experience in Burgos). After an enormous dinner in the only bar in town, and a good sleep, we set off early today. Sadly this part of the Camino lacks the pretty countryside and friendly puebitos of Navarra and la Rioja. Instead, we ambled past numerous residential, industrial and agricultural buildings, but even here we were greeted by occasional sightings of rabbits and storks. We stopped – whenever we could – for small breaks to rest our fussy knees. Eventually, the Camino opened out into the countryside again and the sun started to blaze down, revealing golden fields of wheat, framed in the distance by snow covered mountains. A short walk more and we discovered this hostel, complete with outside terrace and free massages. What more could a pilgrim want?